Welcome to the Town of Montverde! Florida's Department of Transportation's presentation on the widening project that will effect traffic around Montverde in the coming years. CHARTER, CODE OF ORDINANCES AND LAND DEVLOPMENT CODE Town of MONTVERDE, FLORIDA Codified through Ordinance No. 2017-044, adopted January 9, 2018. (Supp. No. 9). 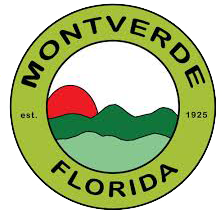 The Town of Montverde is not responsible for information not owned or maintained by the Town of Montverde.